There is a rich tradition of nursery rhymes and children’s songs in Spanish. My children grew up singing them, and my students have lots of favorites, too. Canticos brings these traditional verses to life with their beautiful Spanish nursery rhyme books, apps and videos. 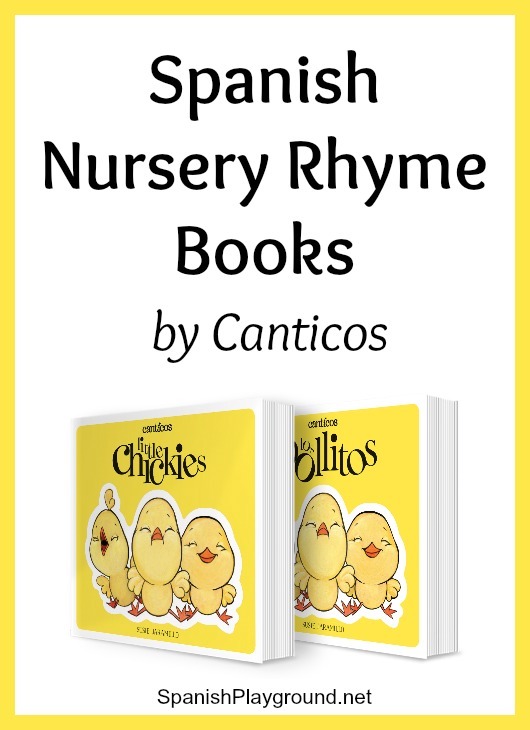 The Spanish nursery rhyme books by Canticos are based on the best known traditional children’s rhymes and songs. Their books, Los pollitos, Los elefantitos, and Los ratoncitos are cultural classics, and they provide an excellent language experience for native Spanish speakers or Spanish learners. These books have received starred reviews from Kirkus Reviews, Publishers Weekly and School Library Journal. Visit Amazon (affiliate) to purchase Los pollitos, Los elefantitos, and Los ratoncitos. Canticos Spanish nursery rhyme books are not typical board books. Their design makes them special, and especially effective for learning language. The books open out, so that children can see the whole story and how it develops. This is a fabulous design for engaging kids with the story! I am also pleased that the story is told in both Spanish and English, but that the languages are separated on different the sides of the book. In addition to engaging children with endearing illustrations, these Spanish nursery rhyme books are interactive. There are lift-up flaps and spin-wheels to pull children into the action of the story. Kids love these books, and want to read them over and over again. That, of course, is key to language learning. Like Canticos, the Association for Library Service to Children has recognized the power of Spanish nursery rhymes in early literacy. Read about their campaign Babies Need Words Every Day: Talk, Read, Sing, Play and download free posters of Spanish nursery rhymes. Canticos is creating apps and videos to accompany their Spanish nursery rhyme books. These apps and videos expose children to native speaker pronunciation and ensure they will learn the melodies and rhythms of the rhymes. The app for Los pollitos and another for Mi burrito are available in iTunes (and free as of this publication date). You can see the video for Los pollitos below and find more on the Canticos YouTube channel. Canticos is a wonderful way to share the treasures of Latino culture with children. They have new books in the works, including Las mañanitas, so watch for more titles coming soon. Learn more on the Canticos website. As you’ll discover, they design Spanish nursery rhyme books to be pretty, playful and perfect for language learners.